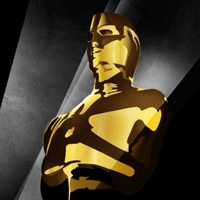 Get ready for some Oscar love! Want to go head to head with me? Copy and paste the ballot at the end into the comments to throw down with your own predictions! UPDATE: I have added the Actual Winners as they are announced, and if different than my predictions, my response. Final tally – 19 out of 24, same as last year! Now to get to actually seeing all these films beyond what their trailers have to offer! Also, congratulations to Kaylee in 2nd Hour and Sam in 3rd Hour for scoring the highest number correct in the student competitions. 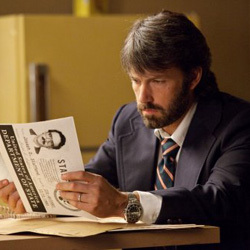 Affleck checked and rechecked the nominees list to make sure there wasn’t some sort of mistake that he wasn’t nominated for Best Director. 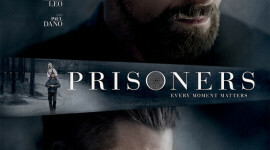 At the very least, his beard should have gotten an acting nom. It would take a veritable act of God to stop the wheels of award glory that Argo is riding on. It’s won pretty much every best picture award from WGA to DGA to SAG to WTF. (That last one isn’t real, BTW.) Odds are the Academy, which is made up of many of the same members as these other organizations, will follow suit. Who knew a movie about math would be so popular? I figured people would stop watching after 3.14159. 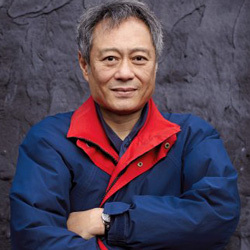 Traditionally it’s rare for the Best Picture and Best Director awards to not go hand in hand. This year, that isn’t even an option for Affleck with Argo. Some are calling it a “snub”, I’m calling it a simple issue of math – with 9 nominees for Best Picture (all deserving in some regard) and only 5 nominees in Best Director, someone had to be left off the list. However, after seeing the veritable torrent of trophies raining down on Affleck this year, this looks to be a situation where the Academy has egg on its face for not even nominating him. So with Affleck out of the picture, it’s kind of anyone’s game. I really think this comes down to Spielberg for Lincoln and Lee for Life of Pi. As much as I love Sir Stevie, I’m going to predict Lee will take the prize, and be equally pleased if Spielberg takes home a third win. I had the strangest dream that suddenly my money started speaking to me. Then I realized it wasn’t a dream, it was an Oscar-worthy performance. Really, watching this movie was like seeing a $5 bill come to life. (Oddly the film did not receive a nod for makeup and hair, despite so many of the actors being made up to resemble their real-life counterparts.) It’s nice to see Bradley Cooper recognized for something outside of the Hangover series, and great to acknowledge Hugh Jackman’s talented singing performance, but Denzel already has two Oscars, and Joaquin Phoenix alienated so much of the community with his “I’m retired to pursue my music career – psych! It was all part of a crazy mockumentary art film that none of you saw!” act that I can’t imagine he’ll be re-emerging as an award winner any time soon. J-La is confident in her win, while Cooper seems to be in disbelief over his inevitable loss. Chastain is definitely deserving, Amour seems too obscure for the 86 year old Riva, and Watts’ chances of winning for The Impossible seem to be just that. Although it’s cute to see Quvenzhané Wallis nominated, and she did give a lovely performance for an 8 year old, Keisha Castle-Hughes couldn’t do it for Whale Rider, and neither will she. Lawrence seems to be all the buzz, and she came close but missed with Winter’s Bone, so this might be the year the Academy seeks to make that up to her. I’m going to go with the flow and predict Lawrence to take it, although it would really tap into my soft spot for the elderly to see Riva up there accepting. To be honest, I probably had the toughest time calling this category – especially since they’ve all won before. 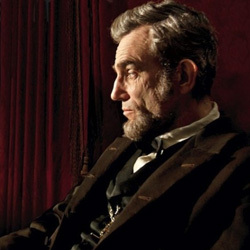 Although Waltz had a substantial role (based on screen time in the trailer that is), Arkin is kind of a crowd favorite since Little Miss Sunshine, but Tommy Lee Jones won the SAG, and was probably one of the more outstanding performances in Lincoln. (Even if it was just the usual sad, grizzled Tommy Lee Jones.) 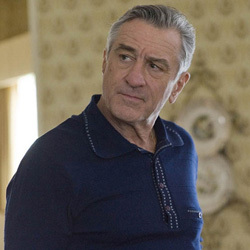 There’s also a decent amount of buzz around De Niro. About the only one that would surprise me is Hoffman, although I’m sure his performance was worthy of the nom. Between Jones and De Niro, I’ll flip the coin and go with De Niro. My Response to the Winner: Fair enough. This category was a toss-up all around, with all five being previous winners. I don’t think anyone could have called it with extreme confidence. So, congrats Mr. Waltz! 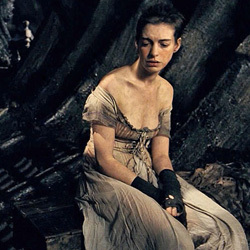 Don’t look so sad Anne! You’re about to win an Oscar! Even in the trailer Hathaway steals the category with her performance, and she’s really only in the first portion of the film. Sally Field has had her day (yes we still like you), Helen Hunt too, and although Jacki Weaver completed the 4-acting category quadfecta (is that a word?) for Silver Linings Playbook none of them have much of a chance at this one. Amy Adams is definitely due after multiple noms with no wins, but I don’t think this is the one. It would be a terrible slight to Hathaway if the Academy did use this as a pity win for Adams. Look for Catwoman to take to the stage… and probably cry. Will Ralph wreck Pixar’s chances at taking the Oscar? Although Brave could prove a strong showing in this category, and it’s a much better entry than Cars 2 for Pixar, I think Wreck-It Ralph has more promise this go round. The others are all worthy of mention, but Aardman’s work on Wallace and Gromit has already earned them a win, and Burton’s work is nothing all that different from his previous work, same with Selick. 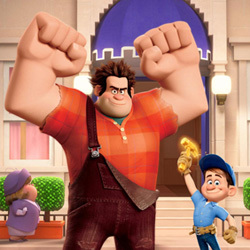 My Response to the Winner: Well, as much as I like Pixar, it seems like Wreck-It Ralph was a solid entry from Disney that wasn’t connected to Pixar directly. On the other hand, I believe this was the first woman to win for direction of an animated feature, so… history! Let’s not lie, the trailer has some stunning visuals of the story of a boy on his boat. For all of the other categories Pi will come up short, its visual appeal has to win it something, and this category is one way to make up that ground. Hopefully that train station has a sandwich shop, cause Keira needs to eat one. Karenina really has some cool choices made in how scenes flow from one to the next, and the visual style of the sets is captivating. 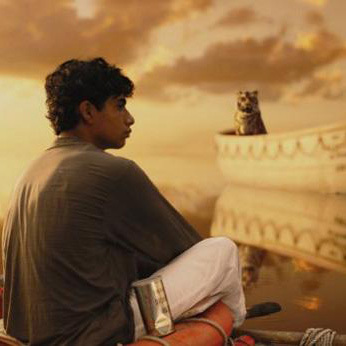 Again, having only seen the trailers, I’d say this film deserves some recognition for the visual choices made by the production staff, and this is the best place to do that figuring cinematography will go to Life of Pi. My Response to the Winner: All the nominees had some very nicely done styles, I just think Karenina had a much bolder visual style than the others. Not sure I would have ever picked Lincoln out of that group, but there you have it. 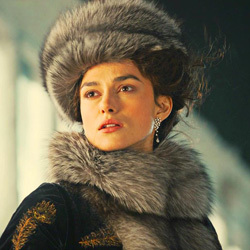 If nothing else, Karenina should win for Knightley’s spot-on bear costume. Almost always goes to a period piece, problem is they’re pretty much all period pieces. Mirror, Mirror and Snow White cancel each other out, Lincoln doesn’t seem bold enough, and Les Mis has more gritty realism, but the lavishness of Karenina will probably give it the edge. Although Hitchcock did a remarkable job making Anthony Hopkins resemble the late filmmaker, Hobbit did their makeup work 13 times over. But really, I can’t get over how Lincoln and its spot-on likenesses is strangely MIA in this category. I mean, seriously, you can have five nominees, why stop at three? If Hitchcock can get the nod for making a handful of actors resemble people in history, Lincoln did that five times over. 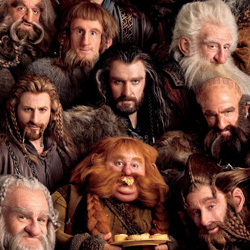 But, with Lincoln out of the running odds are in favor of Bilbo and company. My Response to the Winner: Uh… well…. sure. Not gonna lie, that would have been my last selection. Maybe the Academy was wanting to throw some more love its way since most of the big awards will be going elsewhere – and there’s the fact that the LOTR stuff has been acknowledged in the past. Wait, wait, wait. Singing AND acting? At the same time?!? You’re a madman, Hooper! It’s a freaking musical. It requires a balance of the orchestra, the singing, the sound effects, the dialogue – it’s a mixer’s nightmare, but also potentially their golden ticket. Plus, with the bold move to do on-set recordings instead of the standard pre-recorded lipsyncing, this should win over the minds and ears of the Academy members. This is a tough one. There are plenty of examples of good Visual Effects work this year, and some are far more subtle than others. 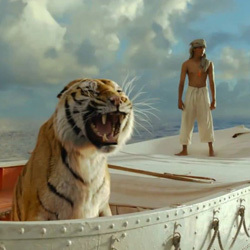 Last year I thought the motion capture work on Caesar would lock the category for Rise of the Planet of the Apes, and the Hulk from Avengers is in that exact same boat, but (speaking of boats) Life of Pi was such an artsy-fartsy use of Visual Effects that it may sweep the Academy’s eyes off their feet. Although I’m predicting Life of Pi, this is one category I’d be okay with being wrong about. Sure, this whole story concept could have been simplified with the ol’ Yawn-and-Stretch technique, but their version was so much better. If nothing else, this song should win an Oscar for most uses of its own title in the lyrics… oh wait, “It’s Hard Out Here for a Pimp” already won in that category. 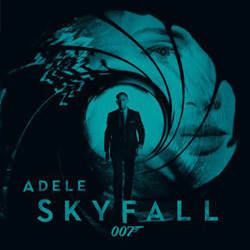 Three things “Skyfall” has going for it – 1) It’s by far the most well-known of the songs, having a very public run on most pop radio stations, 2) The huge popularity of Adele these days, 3) It ties back into the roots of the Bond theme songs of yore, giving it an artsy connection to tie up the other spectrum of voters. That combination should prove to secure Adele an Oscar to keep her Grammys company. 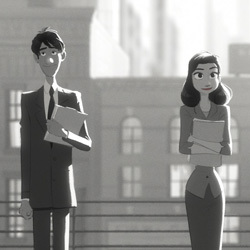 Although “Chasing Ice” allowed Scarlett Johansson a chance to show off her singing chops, and Norah Jones’ “Everybody Needs a Best Friend” plays into the Academy’s love of friendship-themed songs with on-the-nose lyrics (I’m looking at you Randy Newman) neither hold the clout of “Skyfall”. “Pi’s Lullaby” doesn’t really stand out in this crowd, serving almost as more of a score contender. “Suddenly” seems more like a desperate attempt to win a music-related Oscar for a musical film with otherwise completely unoriginal (simply in that it already existed as a stage musical) music. Yes, they may have some explanation about how this ties in a long lost element of the original book, but this has Oscar grab written all over it. Sadly the song doesn’t hold up to the quality of the original Les Mis music, and in a film where the acting takes precedence over the singing, the auditory experience alone just doesn’t cut it. When I need to find calm, I go to my happy place, drifting serenely on an endless ocean with no one around but a… oh, dear lord it’s a man-eating tiger!!! What can I say? I love me some John Williams. Sadly, I think he will be turned away again. Life of Pi was by far the most soothing soundtrack of the bunch, with both Skyfall and Argo having more edgy sounds to them, and Karenina is mostly ballroom music. Pi will take it, although I wouldn’t be disappointed if Williams whisked another trophy home to his massive collection. I don’t even know, I was way off last year, and trailers aren’t much help in this category. It could be anyone’s game, but I’m going to say this is another one where Life of Pi gets some love because it’s the same people who did Hugo, and they took it last year. Maybe they’ll get the back-to-back wins. My Response to the Winner: Well… one of the random times where I was not only wrong once, but twice in the same category. Didn’t have a strong feeling on this one, again, it’s hard to tell from the trailers, and I’m sure both were deserving. Tarantino may be over-the-top in his use of language and violence, but let no one say his stuff isn’t original. I’m just not sure the others have what it takes to overshadow Tarantino’s style. What can I say? People love them some Argo. 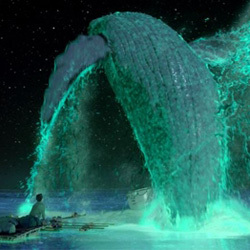 Although Beasts of the Southern Wild or Life of Pi could get a surprise nod here. By far the most well-known of the nominees this year, although based on the trailers, most look interesting enough to watch. Although these all looked pretty powerful, Searching for Sugar Man seemed to be the only upbeat one in the pack, and that breath of fresh air may be enough to make the Academy thankful. Plus it’s been doing well on the other award circuits. A film about a homeless kid who wants to be an artist, could have that heartwarming cheer-for-the-protagonist edge to win out the category, although the others really do tug at the heartstrings. Monday’s at Racine and Open Heart will make it a tough call. It’ll be close, but Inocente is my shot in the dark. King’s Point, despite my usual soft spot for the elderly in films, seems to portray mean, crotchety old people, so no vote in their favor. Let’s not lie, shot in the dark here. But the trailer was by far the most entertaining of the group. The shot of the little girl dancing down the bowling lane is pretty awesome. I could also see it going to Buzkashi Boys, but I’m going with the one that made me laugh, Curfew. Another hard one to gauge based on the trailer, but based on its momentum, this will probably be another pickup for Affleck and Co.
And that, as they say, is that! Last year I went 19 correct out of 24 – can I best my previous score? Can you beat my previous score? Feel free to make your own predictions in the comments section. Don’t forget to tune in on Sunday to find out the actual winners!